The collection of sacral art exhibits of the Roman Catholic Church unfortunately is not sizeable and for this reason their review is limited. They come from old churches and wayside shrines and they are mostly from Przemyśl diocese. These works of art were created by anonimous artists, but possibly future research let us connect some of them with definite workshops. Gothic. 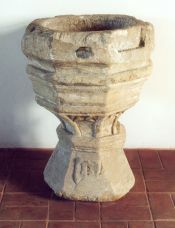 The oldest exhibit belonging to this collection is a stone baptismal font dated to the 2nd half of the 15th century, which comes from St Michael’s Gothic Parish Church in Sanok, but it did not exist to the present day. Other three works of art may be dated to the 1920s and 1930s of the 16th century, which means to the end of the Gothic times. A small sculputre of St Anna Samotrzeć, which probably comes from the private cult, still has got an authentic polychromy. 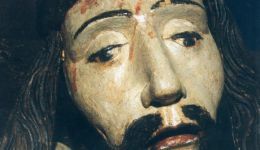 The crucifix from the parish church in Mrzygłód is full of expression. On this crucifix there is Christ with a tense body, a sorrowful face, open eyes and the perizonium on the hips, originally plaited in a dymanic form, but it had not been preseved to the present day. 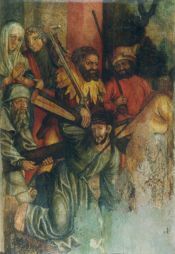 The example of the local reception of Dürer’s graphic art, which can be found in a part of old Gothic altar with a presentation of Christ falls under the cross, shows an artist as someone who can individualise faces of a painted person. Renaissance and Mannerism. 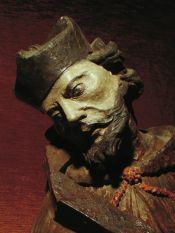 In the museum collection there are not typical Renaissance sculptures and paintings from the 16th century. Nevertheless there are some exhibits everyone should see. In the Lord’s Transfiguration Church in Sanok there is a tombstone of the foreman Sebastian Lubomirski, which comes from the old St Michael’s Church and it is a unique example of a stone picturesque sculpture assuredly from Cracow workshop. 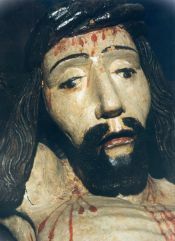 Two not too big crucifixes, dated to 1600, show a placid body of Crucified Christ and are connected with searching for harmonious beauty of antomy and restrained expression. Two kneeling figurines, possibly sheperds from Nativity crib can also be associated with the 16th century. The sculpture of Mary Immaculate from the 1st quarter of the 17th century, which comes from the church in Niebieszczany, is the example of Gothic Revival in that time. After the Council of Trent (1545-1563) the Catholic Church was in counter-offensive and made good use of art. In those days the main subjects were St Mary’s presentations, especially connected with Her glorification. Before the Baroque started, there was a reversion to the Gothic forms, which at that time seemed to be more suitable to sacral puropses than too secular Renaissance art. In this convention, with some faraway traces of Gothic, a painting of St Anna Samotrzeć is put on show. Baroque. Most of exhibits of the Roman Catholic Sacral art in the Historical Museum collection are equated with Baroque and late Baroque, and in a stylistic way also with Rococo. There are local works of art, sometimes with primitive, folk forms, and paintings which are the reflection of great masters’ creation from Renaissance and Baroque times. The paintings produced by Italian painter creating at the turn of the Mannierism and Baroque, called G. Pagani, come from the church in Bóbrka which unfortunately had not been preserved up to now. The painting entitled “Mourning over Christ” is based on Ruben’s drawings. In many works of art there were reflections of commonly venerated images, such as: “The Mother of God from Częstochowa”, “The Mother of God from Leżańsk”, “The Dzikowska Mother of God” or “Christ Milatyński”. One of the most interesting presentation is an oval painting which shows Częstochowa effigy against a background of Jasna Góra fortress with St John the Baptist and St John the Evangelist on sides, assuredly connected with Hospitaller Knights of St John of Jerusalem. Also two altar paintings created on boards are dated to the 2nd half of the 17th century: “St John leading Infant Jesus” from 1677, painted by an excellent artist and typical Baroque “The Annunciation”. At the end of the 17th century on the Mariemont hill in Zagórz there were built the church and the monastery of Discalced Carmelites. On the high slope on the Osława River we can still admire marvellous remains of this spectacular architecture. Moreover, two Baroque sculptures which come form this temple – St Teresa of Avilla and St John of the Cross – are depicted in the museum. Among late Baroque and Rococo sculptures there are two works of art from Lvov School, which originate in the 2nd half of the 18th century, and have a special value. Extremely expressive are John of Nepomuk and some unknown saint as well. Two enormous and full of movement altar paintings – “John of Nepomuk” and “Michael the Archangel” one may identify with the 18th century. Folk art. In the museum collection there are also many graphics, sculptures and paintings on glass made by folk artists. The crucifix with two angels and a few sculptures, which depict Worried Christ are real masterpieces. St Sophia with daughters, painted in a synthetic and decorative way is truly remarkable oil painting. Many a time at the temporal exhibitions a collection of folk woodcuts is presented.